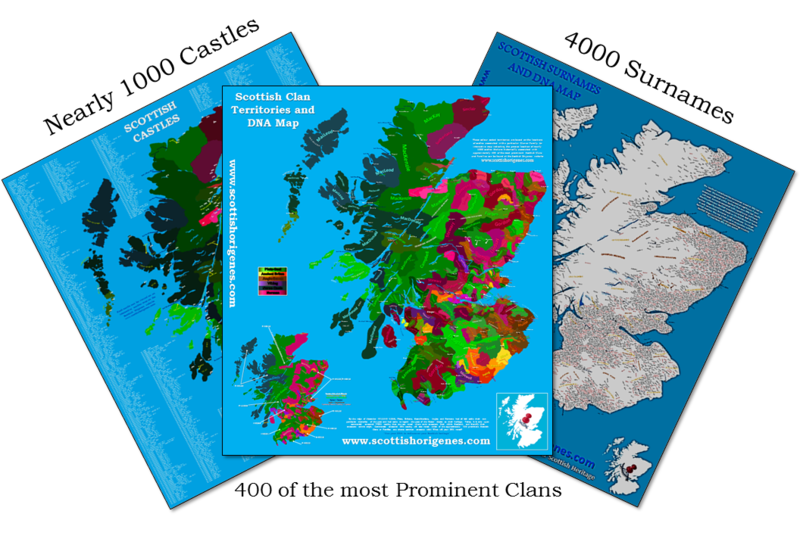 DETAILING the origin of approximately 4,000 different Scottish surnames, the Medieval territories of 400 of the most prominent Scottish Clans and Families, and the precise location of 1000 Scottish castles (plus the Clan or Family historically associated with each castle), in addition to a map illustratin the location of the dominant Y-DNA genetic markers in Scotland! The Scottish Origenes Surnames, Clans and Castles Maps are all you need to help make sense of your commercial DNA test results and identify where your Scottish ancestors originated. The maps can be pruchased at a discount here ($79.99) or individually ($29.99 which also covers postage and packaging). Some sample images from each map can be viewed on the Scottish Origenes Facebook page here. You can read a sample DNA Case Study report here which guides you through using the Maps with your commercial DNA test results. If you have not taken a painless commercial DNA test already, but would like to do so, or if you have DNA test results and would like a FREE CONSULTATION then click here to contact me.